Born in the town of Panni (FG), Italy, Stanislao Sullo's fascination with color began when in 2002 he opened his men's clothing store, Monsieur, in Bologna. Immersed in the world of fashion, he worked with local artisans to create lines of menswear with innovative color combinations and led his brand to become one of the most prestigious in northern Italy. His storefront window displays were noted for their originality and he quickly became sought after as a window designer for businesses throughout Bologna. 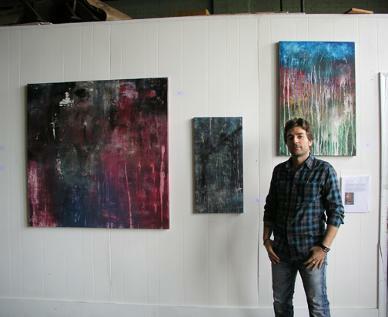 Arriving in New Haven, Connecticut three years ago, Stanislao has continued to explore amalgamations of color through his work in storefront design and through his paintings. He combines media, oil and acrylic paints and wax, to create textured and atmospheric images on large scale supports of canvas, linen, and wood. He paintings subtly layer and juxtapose hues to provoke each individual viewer's won memories and experiences of color. My work expresses everyday emotions – simultaneously concrete and fleeting, recognizable and imperceptible, extraordinary and unexceptional – through experimentation with various color palettes and combinations. I take inspiration from my work in fashion design and as a specialist in storefront window display as well as from my travels. Color is the substance of the landscapes and panoramas that surround us in our lives; it can depict our moods and define our visual perceptions of the physical world. Through the medium of paint, I recall the ever-changing expanse and greens, reds, and browns of my southern Italian hometown located on a hilltop of the Apennines. Tones of blue evoke time spent in Greece as eclectic bright colors describe the chaos of Tokyo. I am ever stirred by the museum-scape of Barcelona, dotted by the late works of Miró. Juxtapositions of color can represent events, episodes, or memories of our individual journeys through life. Experiencing color through art is a way to dream, to reminisce, and to reify emotion.